When you are working at our home or elsewhere, having the right type of mat to keep you properly supported is very important in ensuring your comfort and safety. Our best exercise mats in 2019 reviews feature some of the most dependable mats when it comes to quality, durability, and functionality. As you browse through our list, you should be able to find an item that would meet your needs whether you are into gymnastics, mixed martial arts, yoga, or Pilates. 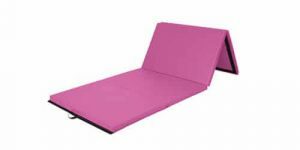 A good exercise mat should be thick enough to provide a nice cushion for you, depending on your preferred activity. For instance, if you are doing yoga, a thinner mat is a better option since using a cushy one may limit your ability to maintain your balance. On the other hand, gymnastics, Jiu-Jitsu, and other sports that involve landing on the floor may require a thicker mat with plenty of cushion and support. Otherwise, a thin mat will be of no use if it will only cause you to hit your body hard on the floor. The right length and width of the mat are also important aspects to look into, as well as the sturdiness of the material used and the reinforced stitching on the edges. 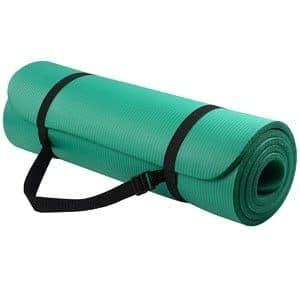 With all these in mind, let us go over our best exercise mats in 2019 reviews. Find out which among these items match up to your standards and preference as you look into their features and benefits below. 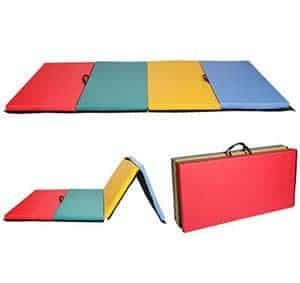 Mainly, the purpose of this puzzle mat is to protect the flooring from scratches and other types of damages caused by sharp materials or abrasion from your footwear. If you have a home gym, or you need a non-skid textured mat for your gym floor, then this product is an excellent choice. The pieces are lightweight and easy to connect to each other, so you can have your cushy flooring set up in no time. You can also use these for play areas, garages, basements, and other places that need protection for the flooring. The dense foam used in this mat is sturdy enough to handle workout equipment including kettlebells, weight lifting benches, treadmills, and dumbbells, to name a few. Plus, the pieces are water-resistant, so they do not deteriorate easily. However, the mat is a little slick on the surface when you are walking barefoot or with your socks on. This is an extra long mat that measures 70 inches in length and with a width of 23 inches. 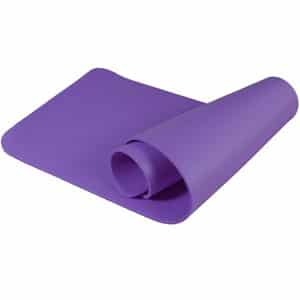 Moreover, it is quite thick, so you can use it as a supportive pad when you do your floor and lying down exercises. This mat also has a non-slip surface on both sides, so it can grip securely on the floor instead of sliding or shifting in place whenever you move. Whenever you need a mat for stretching, aerobics, and similar activities, this exercise mat is for you. 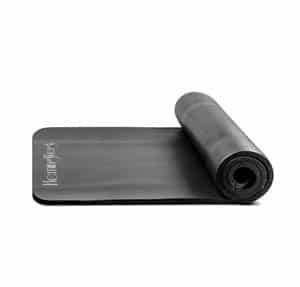 You will like how lightweight this mat is, so it is not a hassle to take it with you wherever you go. The surface is also moisture-resistant, which makes it a breeze to clean. But one word of caution – when you roll it up, be sure to do so carefully to avoid ripping the elastic loops. Measuring 71 inches in length, this is a long mat made from high-density foam with 1/2-inch thickness. With a good amount of cushion, you can protect your elbows, knees, spine, and hips from pain when these come in contact with the hard floor. As both surfaces are double-sided and non-slip, the mat will not shift easily. This is important when you are performing restorative or inversion poses. With a strap included, it is easy to transport this mat by simply carrying it over your shoulder. You may notice a slight chemical smell initially on the mat, which could be because it is brand new. However, the odor should dissipate in a few days after airing it out. 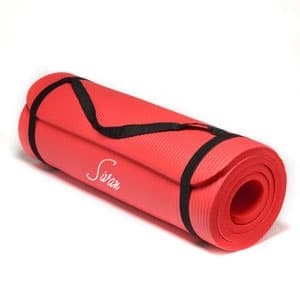 A thick and supportive mat for yoga, Pilates, and other types of exercises, the Sivan Health and Fitness mat is half-an-inch thick to give you a good amount of cushion and protection from the cold, hard floor. There are also non-skid ridges to prevent the mat from slipping, and it has a carry strap that makes it convenient for you to bring it along with you. As this mat is made from memory foam, you can be sure to get maximum impact absorption, support, and comfort that you need. This mat is more on the squishy and thick side, which should be great for gymnastics. However, for standing balancing poses in yoga, it may not be appropriate because of too much cushion. 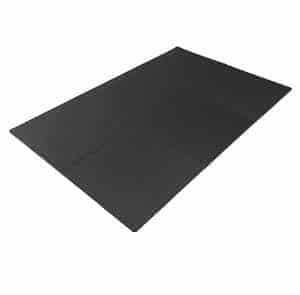 A much thicker mat than the others featured on this list, this product is 15 mm thick and 72 inches long. It comes with a moisture-resistant and non-stick surface that makes it more comfortable for you to do your workouts. With a non-slip bottom, the mat grips the floor securely to prevent you from slipping or encountering other types of injuries. 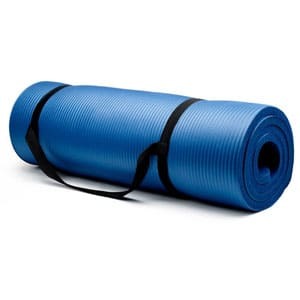 You can also use this mat for camping trips aside from workouts because of its supportive and cushy quality. 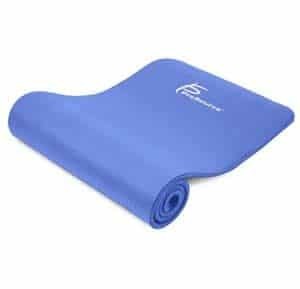 For those who need a thick mat to sleep on or for use during their gymnastics routines, this product should be a fine choice. But if you need to perform balancing moves, you may find this mat tough to work with because of too much cushion. Designed with a non-slip surface and superb grip to the floor, this all-purpose exercise mat is one that you can use for your workouts or yoga poses. It is resilient and grippy, which allows you to maintain your balance no matter what type of exercise you perform. With a moisture-resistant quality, you can easily clean the mat with a damp cloth and dry it quickly. What’s more, this is a lightweight mat with a carrying strap, so you can transport it without any problem. It is a little bigger than some mats, which makes it somewhat bulky. Even with the added width and length, though, it is not heavy to carry around as there is a strap. 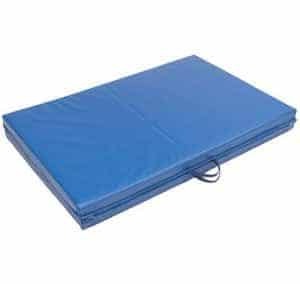 Perfect for gymnastics, baby’s playroom, or a home gym, this folding mat is very large and can cover a large area. It is thick and cushy, and the foldable design makes it easy to store and transport. Also, the surface is non-absorbent, so all it needs is a damp cloth for cleanup, and it should be perfectly clean in an instant. With sewn-on handles, you can carry the mat from one place to another without a problem. The mat tends to slide when placed over hardwood floors. So you may have to use something to keep it secure and prevent the mat from shifting when you move to prevent injuries. At 10-feet long, this is an extra large exercise mat that you can use when setting up a home gym or perhaps a play area for your kids. It is constructed from high-density foam that is truly soft and cushy, so it protects your body from the hard floor whenever you do your crunches, push-ups, and other types of floor exercises. With a 2-inch thickness and firm foam quality, you can do your exercise with ease an comfort all the time. You can also connect this to another mat when you do your tumbling runs and other gymnastics routines. Without a doubt, this is a sturdy and thick mat. 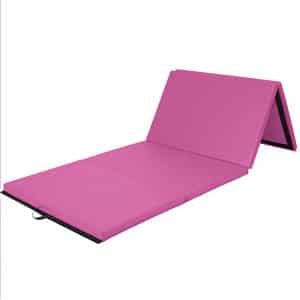 It is supportive and easy to lay on the floor, as much as it is effortless to roll it up and store after use. Working out at home has never been this fun and worry-free, thanks to this fitness mat. It offers a comfortable area for your exercises, as it is firm and supportive at the same time. Whenever you need a mat for home acrobatics, Mixed Martial Arts, floor exercises, and even a portable sleeping mat, this should be great for these purposes. The surface is also easy to clean because of its non-absorbent feature and PU leather material. This is truly an excellent mat for the purpose intended for it. However, the Velcro tends to stick to the rug, so make sure to lift it gently in case it does stick. Otherwise, you might cause damages to your carpeting. When it comes to a thick, comfortable, and supportive mat, this product should be an ideal choice as it comes with a 1/2 inch thickness. It offers comfort and impact absorption, so you can spare yourself from sore ankles or knees whenever you do your restorative poses during yoga or Pilates. There is also a non-slip surface to keep the mat in place whenever you go from one pose to another. With various color options available, your choices are not limited. The surface is indeed comfortable against the skin, but it may also be prone to tearing if you use the mat for body weight exercises. The thickness of the mat also makes it a bit challenging to maintain your balance when doing yoga poses. We hope that you were able to find the product of your choice after checking out our best exercise mats in 2019 reviews. Please feel free to go back to our featured items to compare the products and discover the right one ideal for your particular needs.